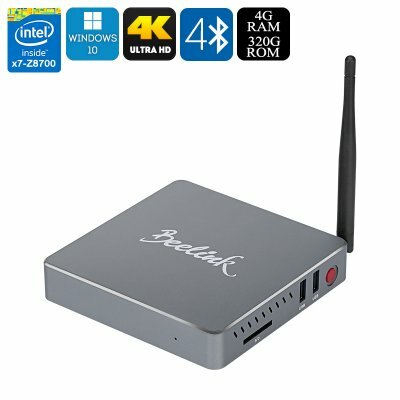 Successfully Added Beelink BT7 Windows 10 Mini PC- 4K Support, 4GB RAM , 320GB Memory, Intel X7-Z8700 Quad Core CPU, Bluetooth 4.0, Wi-Fi, to your Shopping Cart. The Beelink BT7 Mini PC is one of the most powerful Intel Atom mini PCs around. With the X7-Z8700 64Bit CPU and 4GB of RAM everything is ready for a stable and powerful performance. To keep everything cooled efficiently this mini PC has an aluminum case to disperse heat efficiently and a built in fan it brining it active cooling, so it can run harder for longer without any concerns of overheating. This version of the Beelink BT7 mini PC has a spaciously 320GB SSD and with an SD card slot you can add up to 128GB of extra storage, if that still isn't enough you can always store data on a network drive and use the Gigabit Ethernet or dual band Wi-Fi support for speedy network access. With 4K decoding this windows TV box is able to handle a huge array of video files so you can play ultra 4K movies that will be displayed in a picture perfect full HD resolution. This will make gaming and movies nights a true delight and can even handle image processing as well. Coming with a full licensed version of the Windows 10 operating system this mini PC brings access all the productivity software you could need as well as a huge number of games, with a wall mounting stand it's easy to conceal behind your TV or monitor and will turn any HDMI TV into a fully function PC or entertainment hub. This Beelink BT7 Windows 10 Mini PC comes with a 12 months warranty, brought to you by the leader in electronic devices as well as wholesale Mini PCs..
Use Beelink BT7 Windows Mini PC, is just excellent product !